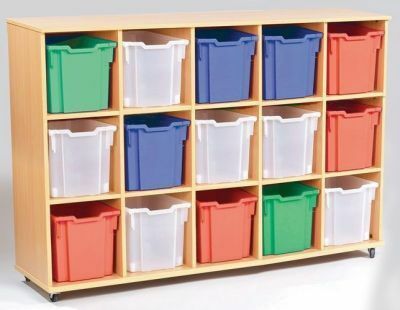 Single column jumbo tray storage with fifteen Gratnell storage trays in a choice of colours. Manufactured from 18mm thick MDF in a choice of Oak, Beech or Maple. Static or mobile. Supplied assembled and delivered free to the UK mainland. Lead time 10 - 15 working days.